Striking cuisine is on the menu this April at The Royal Budha. Our team of native Thai chefs have devised a splendid array of authentic Thai celebratory dishes to mark the traditional New Year of Thailand. According to George Sarkis, Director of Food & Beverage at the hotel, Songkran is the grandest of all Thai festivals to commemorate the New Year, a time when houses are cleaned and decorated with flowers and flags, and the famous Water Fight takes place throughout the country with splashing of water symbolizing cleansing and rejuvenation. 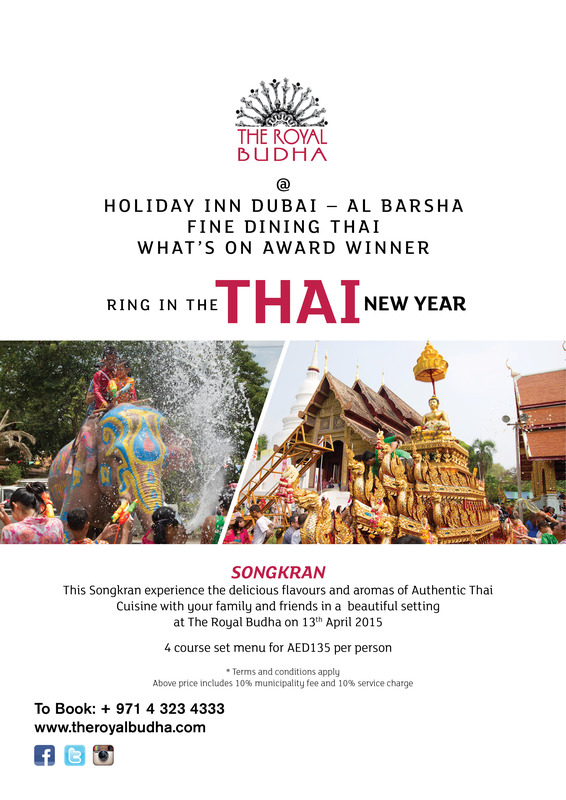 “Mirroring that celebration, The Royal Budha will be in full festival mode on April 13th, offering diners an authentic taste of Songkran created by Thai master chefs who combine heat, spice, citrus, textures and a blend of flavours to surprise and delight,” he said. Signature dishes at the restaurant include Pla Nueng Se-Ew (Steamed whole sea bass fish with soya sauce and ginger, garlic and Thai celery); Kana Nuea Nam Man Hoy (Wok fried sliced Beef Tenderloin with Thai broccoli leaf, black mushroom, garlic and oyster sauce); Goong Pad Pong Kra Ree (wok fried prawns with chili oil and turmeric), plus Thai favourites; satay, noodle salads, soups, seafood, red and green curries and a comprehensive vegetarian selection. Set in the heart of New Dubai, Holiday Inn Dubai – Al Barsha is a perfect blend of contemporary design and classic elegance. The hotel has 310 rooms including 54 suites. Each room is equipped with the latest facilities, tastefully decorated to meet every guest’s needs and comfort. Business houses have access to a wide variety of conference venues equipped with state-of-the-art technology. Completing the Holiday Inn experience are the award winning restaurants “The Royal Budha” (Thai), “Gharana” (Indian) and “Xennya Terrace Rooftop Bar & Lounge” (Rooftop Terrace) as well as bars, banquet facilities and impeccable service.